The following PowerShell commands have been used to provision an DS3 Standard VM with a single premium P10 disk hosted by Premium Locally Redundant Storage (benchmark setup). 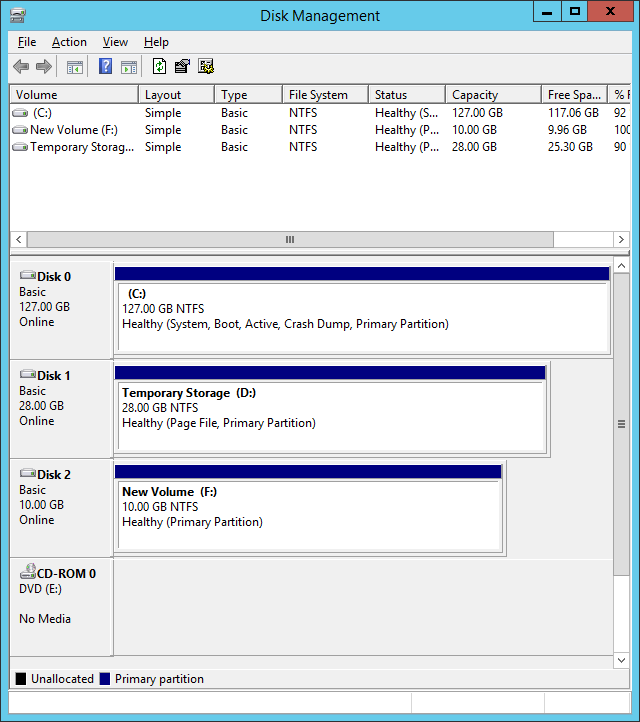 aziostresspremiumdisks – used to host the additional disk mapped to the VM. The IOPS benchmarks are performed on the additional mapped disk. The aziostresspremiumdisks storage account will only host the additional virtual disk (F:\ volume) – so in this way the benchmark tests are not influenced by other workloads. Because of the 500 IOPS limit per P10 disk, in the benchmark we couldn’t reach writing speeds higher than 4.18 MBps. In case you think “Azure Premium storage is based on SSDs, why is that slow?”, the answer is the Azure Premium storage I/O unit size is 256 KB and our benchmarks are using 8 KB I/Os. Azure Premium storage if not filling the remaining 248 KB with other 8 KB IOPS. So, if you reach the 500 IOPS limit with 8 KB I/Os, then you get 4000 KBps (≈4 MBps) writing speed. If your IOPS have been in size of 256 KB, then you would get 100 MBps throughput (because this is a P10 disk limited to maximum 100 MBps throughput). Remember, in general the existing server software solutions are working with I/Os with unit size <256 KB. for read-only operations whatever is higher than 256 outstanding I/Os (heavy workloads) will result in application performance degradation. As can be seen the average latency for read-only operations is growing (up to 62.82 ms) and gets just a bit outside the chart limits. for write-only operations whatever is higher than 8 outstanding I/Os (very light workloads) will result in application performance degradation. As can be seen the average latency for write-only operations is growing (up to 2 seconds) and gets way outside the chart limits. Continue with Microsoft Azure IAAS – storage benchmarks, comparison with on-premises (part 5).